It used to be that I really enjoyed my treks to and fro the coast. However, it's getting a bit harder for me, all the time. Today, I'm headed back to Oregon City. I didn't have enough time here! I just got here! I haven't even spent four days! But, the weather is not in my hands, and I have plants that would be out in the cold, if I don't go back and prepare. Frankly, though, I'm pretty excited about the snow! Whooopee! But, do I want snow there? Or snow here, where it's so pretty!? I have to go back, though. I have no choice! Please be sure to vote on the final five kwikfish! Need help logging in? Contact Jennie for help! Any link on the contact form comes to me. I can help. Wow! So much to do! That's Christmas for you! Ho! Ho! Ho! We have the Kwikfish poll ending tomorrow. Who will win? It looks clear who might win, but you never know! Ho! Ho! Ho! What do you think of this mad-cold weather? I've had a full house! It's been kind of fun. Lots of popcorn nights, and food, food, food! Tammy, my ex roommate has been staying with us, as she doesn't want to have to drive all the way from her house, into work. Work for her, is closer to my house, so it's been fun having Tammy around. 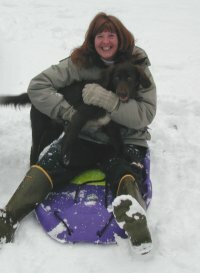 Janet, my roommate here in Oregon City has been able to get time off work, due to the weather. So, we've been a gaggle of giggling girls around here. I think it's driving David crazy. But, oh well! You get what you pay for, David! Actually, I can't complain. David has been weathering the cold, to take Willie out to play for me. I tried, yesterday, but the wind was blowing as fast as it could, and it blew me right back into my car! BRRRR! So, so cold! It was like a blizzard! I drove Willie to the grade school, which was otherwise closed, so that Willie could run free. Well, that's just what he did, minus me. I sat in the car and sang Christmas Carols to him! He loved it! He ran and ran, and barked out the carols along with me! "Willie, the light nosed Springer! Had a very light bright nose! And if you ever saw it, you would even say it glows! All of the other Springers, used to laugh and call him names! They never let poor Willie, join in any Springer games! Then one stormy Christmas Eve, Santa came to say, "Willie with your nose so bright? Why don't you come and guide with your flashlight?" Then all the Springers loved him! As they shouted out with glee! "Willie, the light nosed Springer!" You'll go down in History!" Yeah, I know. I'm silly. But, we have so much fun! It's Christmas time, and the snow is coming down! Or...at least it did, yesterday! You know, sometimes when we get an early start like this, it keeps snowing, off and on. I wonder if it will? And I also wonder... will this be the year we will have a white Christmas!? It would make me SOOOO happy! I miss Bill, so much! I miss the river! I'm stuck here, until the coastal pass clears. I have a dental appointment in Tillamook on Tuesday. It'd better hurry up and warm up! and... "I'll be home, for Christmassssss.... Just you wait and see! They'll be snow, and mistletoe! And presents under the tree!" We have a kwikfish winner, and you can order yours before they run out, here! Oh, brother. Went out to get the trail cam yesterday to reset the date. I don't see as well as I used to, and to say the least, I'm somewhat accident prone. Sure enough, I ran into a tree that had fallen that I wasn't used to. It smashed into my right eye, and a small branch impaled itself into my eyelid. I had to pull it out! Yes! I had to manually extract myself from the tree! When I did that, I began to bleed heavily, because I'm on blood thinners. Bill met me on my way back and of course, was more than freaked out. The entire side of my head is bruised, and my eye is Christmas colored! Red and green! I am so lucky that I don't think I hurt my actual eye. But, I spent last night, worried to death that the trauma would cause the pressure to go up and I'd go through something like I had before with the hemorrhage. But, so far, so good! I think I'll still go into the doc, in case I need stitches or to get some antibiotics, just in case. My eyes are not something I want to be careless about! I'm back at the coast! Good morning, snow puppies! Let's go out and play! I can't believe this white world! It's awesome! I love the snow! There are tiny little snowflakes falling, again! Whoop! Willie! Let's go! The night it snowed the first time, Willie and I went out to the driveway after grabbing Andrew and David's sleds. I got them both, and I don't know why. After a couple fast rides down the hill, I sat in my sled at the bottom of the hill. Willie was licking my face, and I was giggling. But, then, out of nowhere, tears poured down my cheeks. It was the strangest thing. I felt bi-polar! I went from giggles of glee to tears so that I couldn't see. Emotions. It all rushed back to me. Dee Dee, our old black lab barking around David, Andrew and I, and everyone laughing, and having a blast. The good old days! Why was I alone? I listened for the laughter, but you know how it is when it snows. It was silent. The silence killed me. What happened? Where have the years gone, and especially, where are my laughing children? It was one of those moments that I could do without. I didn't ask for it. I went out all excited and came back in the house so sad! I miss Andrew so much, but at that moment, I missed David, too! And Hershey! And Dee Dee! And everything that was happy about young Motherhood! Dang! Talk about a downer. I don't want to be that person that gets sad! That's not me. I want to always celebrate Christmas and snow, and everything happy! I have a friend who has had a very difficult life. Listening to her stories of her family life just make me cringe. I come from a very normal happy family. Sure, we had our challenges, but I was very lucky. Both in my growing up years, and in my own family life. Of course, as things went on, -Well, wait a minute. OK. Some people see that I have had a difficult life, at times. Maybe I have. I have gone through some tough things, but all in all, at least from my perspective, I've been so lucky! Anyhow, my friend sent me a video of her decorations in her house. I was so proud of her! After everything she has been through, to see that her house was all decorated with good cheer made me so happy for her! She has no one to share it with, yet her home was all holly-jollied up with lights and trimmings and Ho! Ho! Ho! Although it really bummed me out to have that (totally uncontrollable) wash of emotions come over me while sledding, I still maintain a holly-jolly outlook, when it comes to Christmas, and hopefully, life in general. My home is all decorated, here in Tillamook. We have a Christmas Tree. We have our big 40 year old jade plant lit up for Christmas. We have our fishing Santa, and it's all set on a timer so that when I wake in the morning, I come down the staircase and am met with the most amazing display of joy and lights. It makes me smile, every morning! But, somewhere in that Christmas magic deep, deep down... there is sadness and loss that lives deep down in my heart. It is alright that it comes out, from time to time. Just as long as it doesn't stay long. Just as long as the paramount emotion is joy and thanksgiving, I'll be alright. I just glanced out at the white expanse of snow covered field out my office window. It's beautiful. A tiny chickadee flit and flew up from the frozen ground to my feeder. He enjoys the black oiled sunflower seeds. Merry Christmas, litte one! I know that I enjoy people's e mail Holiday greetings, and I don't think badly of them when they are sent to me! So, if we get that far this year, we are going to be doing well! Both Bill and I have been so busy with doctors this year that we just haven't found time! Two days ago, during the snow, I took Revvie and Willie out to play. I noticed that Revvie was shivering. You know, she does get cold, sometimes. Always has, but this was weird. As we went on, she increased her shivers, so I called the walk short, and we went back to the house. I covered her in blankets, but she wouldn't stop shivering! By the time it was evening, I went up to find her cuddled on the bed. She was burning up! I took her temp and it was 105. Oh my gosh! That's high! So, we called the emergency vet number, gave her some tetracycline and aspirin, and watched her carefully. Her fever didn't go down, and she continued to shiver, all night. We took her into the vet, first thing in the morning. Salmon poisoning, again!? Yes! It can happen! They can lose their immunity, I guess. Her temp was still 105 at the vet's office. She was given shots for anti nausea and antibiotics. Revvie is 11, and when dogs get older, they often don't respond as well to treatment. Illnesses, just as in older people, can be more threatening. I tried so hard to get water down her, but she wouldn't drink. Then, about evening time, I was walking Willie and Rev came out! She went straight to the river, and drank half of the river! Thank God! She is doing better! I am so thankful! These are the things keeping Bill and I from Christmas cards! If it's not one thing, it's five others! But, we are keeping our Christmas spirit dear to our hearts! No matter what... Keep that magic of Christmas! Our Savior, Jesus Christ, was born on Christmas day! Whoo hooo! I can recover from any sadness, just thinking about that! "And there were shepherds living out in the fields nearby, keeping watch over their flocks at night. An angel of the Lord appeared to them, and the glory of the Lord shone around them, and they were terrified. But the angel said to them, 'Do not be afraid. I bring you good news of great joy that will be for all the people. Today in the town of David a Savior has been born to you; he is Christ the Lord!" Good news, great joy... for all people! Well, it's beginning to look a lot like Christmas! Even though the snow is melting, it just feels like Christmas! Hey! Guess what I found? I thought I was totally out of decals. I thought I had maybe five left and that they were going to be a collectable item, like the Treasure of the Trinity or something! I was looking through plastic bins from the show, and guess what I found? A stack of Ifish decals! You can buy them, now! Whooop! I also found a BIG stack of Salty Dog decals. So, you can get those, too! Whoop! As long as I opened the store, again, I added the pre order kwikfish link to it, and I think I'll go ahead and in March, take pre orders for Salty Dog Burgees. Sound like a plan? There is a link to the store at the top of each ifish page. Order up, folks! Willie cracks me up. He's such a sass. Revvie is such a good, sweet soul, but Willie? Forgetaboutit... He sasses and laughs at me. Every morning I give them treats. A little snack that's exciting, but not quite a full meal. They get so excited about it. They go out to do their business, and hurry in for their "Happy hour". They know that it happens in the office. I haul in my coffee, and treat bowls for the dogs. Willie, following all the way, "Woo woo woooooooo-ing". He talks about everything. Springers are like that. They are so vocal! I think that's why they make me giggle so much. I forgot something this morning, and while they waited, (which they abhor) I lay their bowls on my desk and went back into the kitchen. I said, "Sit! Sit and wait- SIT!" I repeated firmly, and mostly for Willie's benefit. But no. Revvie sat. Right in her place,. (With a bright shiny face.) But Willie? Willie followed me, sassing the entire way. "Woooowoooowoooowoooo!" I can't help but laugh, and that's the problem. I can't be serious with Willie, and Willie can't be serious with me. It's just the relationship we have. He is so darn cute, and his face is mostly sad all the time. I finally have his number. That's why I spoil him so. I work my tail off, trying to get him to smile. But, you can't make a sad faced springer smile! When I go to leave, and he can't come with me, he lays flat as a pancake on the floor with that sad face. I didn't know a dog could get any flatter to the floor. "Poor Willie!" I say, and I turn around and he's wagging his tail, fully knowing that I'll change my mind. Willie has got my number. You think? Revvie, on the other hand, wears her emotions on her sleeve, and she's just a happy dog. Labs are like that. Constantly smiling, constantly happy, no-matter-what. I finally got Willie to sit for prayer before she got his treat, this morning. I do follow through. I do make Willie follow the rules. It's just that I can't help laughing, while I do, so it takes the seriousness out of his training. That means one thing: Spoiled. I raised my head in surprise. "What time is it?" I whispered in fear as I squinted at the clock. "Oh my gosh! 8:20!" Tore open the cabinet and put mascara on my lash! I don't sleep in! Especially when I have something important to do! I usually have this built in kind of alarm clock. I can almost say, when I go to bed, "I have to be up at 4, 5, 6... anything, and I'm up at exactly that time! Well, last night I had no worries, because I didn't have to be anywhere until 9! 9:00 AM! And it was 8:20 already! In my younger days, that would be no problem, but now that I'm older, it takes time to wake up, have coffee, and do what I do on ifish. I simply had to cut my schedule. No Ifish, this morning! That felt SO weird! I have done ifish EVERY morning for as long as I can recall! It wasn't anything fun I had to do, either. Willie hasn't been feeling well, and he had a grooming appointment at 9:00. His digestive system has been a bit messed up. It worried me to take him the dog groomer, without thoroughly letting him use the bathroom. But, it was what it was, and we had to go! )So to speak!) We had to go in the car I mean. Not outside! No wait, he had to go outside. Then, we had to get in the car. I sprang forth with the poo bag, to see what was the matter. So, a brief cup of jo, a brief potty outside, and a fast drive to the groomers is just what we did. And we made it! Poor little guy. He hates the groomers. He doesn't much care to hurry, either. Neither do I! His little frame shook with worry as we pulled into the parking space in front of the groomer. I felt horrible. Merry Christmas, Willie! I'm SORRY! Plus, they said they were over booked and he'd have to stay longer. Half of me was thrilled with the time away from my dog-child, and half of me felt so sad that he had to endure the tragedy of being in a cage! Horrors! "Oh, Willie... I'm so sorry!" "WHOOOPPEEEEE I HAVE ALL MORNING OFF TO FINISH SHOPPING! "Ohhhhh.... Willie! I'll be back, soon... I promise!" "WHEEEE HA! I CAN WRAP PRESENTS!" I had a bi polar morning. More and more, I wonder! It wasn't very busy when I got to the store, but by the time I finished, OH__ My___ Gosh! The place was packed, ear to ear! Now. Let me tell you something that I discovered. First, we all know that the Holidays are difficult for people. Especially people who have recently lost loved ones, or are having any major trouble in their lives. And trouble happens to all of us. Life is hard! Be it divorce, or bankruptcy, or whatever. Life is hard! And for some reason, maybe it's all the nostalgia and expectations of "HAPPY" Holidays, I think we have trouble living up to it. I think that's it. Because ever since I lost Andrew, I have been a victim of not so happy Holidays. It's actually a mix. I love some things, and then, out of nowhere, I get blue. Tears happen. Out of nowhere. So, I tried something this morning, and I have to say it was extremely successful! I think you should try it, too. That's right... Keep it up. Do it some more. And more... and more... and pretty soon, YOU will feel merry! Or, I did! All of the sudden, my blues were gone, and I was really feeling merry! Christmas-like! Happy! It's that time of year! When the world falls in love! Every song you hear, seems to say.... Merry Christmas! May your New Years dream come true! MERRY CHRISTMAS! and a Happy New Year!!!! And I mean that, most sincerely! "Happy Christmas to all, and to all a good-day!" Need help logging in? Contact Jennie for help! Any link on the contact form comes to me. I can help. Merry Christmas! I can't believe it is finally here! My water heater flex hose is leaking, and it's like that water torture treatment. It was dripping every 30 seconds or so, but now... Oh my gosh. Every two seconds! Drip! Drip! Drip! Is it going to explode with hot water, everywhere? I wish I had a crescent wrench! That's what I want for Christmas, Santa! It's like I collect tools as I need them, and I can't believe I've not needed a Crescent wrench! I thought I bought one! Darnit! Did I? Or was it another kind of wrench? It's seven in the morning, and I promised Bill that I would call him with a road report. Please say a prayer for him as it's cold and icy over the pass. I really don't even want him to risk it, but he insists. It IS Christmas, after all! I told him I'd rather have him alive than just about anything else, but he insists, so.... He loves our family Christmas as much... well, not quite as much, but he loves it like I do! I wish for all of you the most awesome family time, ever. Or Christmas Time... or for those of you who have trouble with Christmas, I hope you get through today with no problems. Believe me, I understand the pain of missing people you love. So, I get it. Drip, drip.... drip! :) Love you! Update: I wrote this last night, but update! IT WORKS! It held all night, a load of dishes in the dishwasher, and a hot shower, later... NO DRIPS at all! To this, I thank Cary Schroeder, Scott Nichols David Martin and Cliff at the Oregon City Home Depot! "Man oh man. By the time I'm done with this, I'll be an expert, and if anyone has trouble, call me. I'll be right over! LOL. Yesterday Afternoon: So, I go to Home depot and talk to this awesome guy, Cliff. He's a master plumber and I swear he's more awesome than Santa Claus. He tries to save me money and time and sells me a sharkbite adapter flex hose, instead of having to use primer and glue. "OK!" He tells me exactly how. I tell him I could hug him. He says, "I know you could." LOL Love that guy! Anyone know Cliff at Home Depot in O. City? If you ever have plumbing troubles, go to Home Depot and talk to Cliff. There were 8 guys waiting for his advice, and it was WELL worth my wait! Anyhow, I go home. Cliff also sold me a cpvc cutter. It didn't do a great job, but it worked OK. It was 11.00 bucks and the tool cut a bit crooked. But, it worked for our purposes. Nice and clean. No burrs like when you cut with a hack saw. Anyhow, I cut the pipe off just right! Then, David fit on the sharkbite adapter thingy majigger and thread the other end on the hot water heater. Yippeee! We go out, and David turns on the water main. Oh wait! Found out that the water main at the house, the valve handle is broken off. This is not good, and I will have to have a plumber look at this, later. (Note: Whenever you start snooping around things, you'll find broken things. We go out to the road, instead, and turn the water back on. Go in, and it's not "drip.... drip... drip..."... it's DRIPDRIPDRIPDRIPDRIPDRIPDRIPDRIPPPPPP" The flow turned from the Kilchis in summer to the Willamette in winter. Someone let water out of the dam! Oh man. We had been SO proud of our work and then this! I guess we cleaned the cpvc hose off, so it was nice a smooth, but not good enough. There was still one area of paint on the cpvc pipe. Thus, that broke the magical seal. Now, we turn off the water again and we can't take the darn sharkbite adapter off without a tool. Sold, at Home Depot! I call a plumber. Then another. Then another. NO answer. OK, back to home depot and Cliff is still there! "Cliffff! HELP!" I run to him. There are 8 people waiting for Cliff, again. David Martin and I stand in line and wait. He is more popular than Santa Claus! Finally, our turn with Master Plumber Cliff. He is so kind! Anyhow, he remembers me and helps David and I by saying to bring back the sharkbite thing, and he sold us a tool to take it off the Sharkbite. Then, I got couple gaskets for the old original flex hose and an adapter for the flex hose and the primer and glue to glue it on the [barely enough] cpvc pipe, coming out of the wall. Wah. I STILL want a plumber! But, David is going to be back soon, and we are on to step 288. Two nights of emptying buckets all night! AGH! A Christmas I'll never forget! You know what I did for New Years? I got my fingernails painted with silver glitter! That's all I'm going to do, too! It was fun out fishing the other day with silver glitter nails. I really wanted to catch a fish, because it would match my fingernails! But, darnit! Nothing. I really fished, too. I fished hard. I didn't have any shrimp, though, so it was just a jig. They wanted shrimp. They wanted shrimp, badly. Frankly, it was the first time that I had fished with all my might in quite some time. Willie wasn't happy about it. Imagine that! A dog that doesn't enjoy fishing! He wanted my full attention. "Hey, Mom! Look at me dig!" "Hey Mom, let's play fetch!" But, Mom was busy throwing something out in the river and letting it float by. How silly that must look to a dog that wants my full attention. "WHAT are you doing? Obviously nothing that matters. Look at me, Mom! I'm a good digger!" It kind of reminded me of my Dad and I. He'd take me fishing. I'd be so excited to spend time with my Dad, and then he didn't pay me any mind at all. He just stood by the river, and left me to play in the rocks. Alone! Now, what kind of fun is that for a five year old? I'll tell you what fun it is. It teaches kids/dogs to find their own fun in nature. And that, as a five year old little girl, is exactly what I did. I learned to love the big boulders of the Sandy river. I learned to love the roar of the river, and to watch my Dad, as he excitedly pulled in a beautiful flashy silver fish. I learned to love his excitement over it, and how happy he'd be. And that's what I grew up to do, myself. So, thank you, Dad! I had no idea, that at that time in my life, when I couldn't understand why you took me way out there to be alone, what you were thinking. Maybe you weren't thinking. Maybe Mom had something to do, and I was just tagging along. But, thank you. Because you taught me the most important thing in my life. You taught me to be alone in nature. And at the ripe old age of 56, I still love to be alone on the river. Happy New Year to everyone! And may you all have days full of time alone on the river! Because frankly, when the world's problems get me down, I have a place to go that lifts my spirits and makes me forget about heavy traffic, people in a hurry, and a population that seems to love nothing more than material goods. The river gives me just about everything I need, and it cures the blues in nothing flat! If I'm not head down, hunting for agates, (and banging my head on falling trees! LOL), I've got a dog beside me that makes me giggle. Or-- a rod in my hand that gives me the opportunity to do something that takes my breath away in excitement! A boat came down the Kilchis yesterday, and I visited with the fishermen. One of them said, "What are the odds that when we come down the river once a year, you are always out here?" I thought about that, and it isn't that odd, at all! When I'm at the Kilchis house, that's normally where I am, most of the time. There aren't that many fish in the river, any more. This is the last year that it will be planted with steelhead. So, for fish, people choose the Wilson river. It's packed full of fishermen on a daily basis. I drive by on my way to town, and there are cars overflowing the parking lot and onto the highway. The Kilchis is a river where your odds of catching aren't that high, but there is so much more that the Kilchis offers. It's gorgeous! It's nature at its finest! Tall trees tower over the river. It's breath taking! 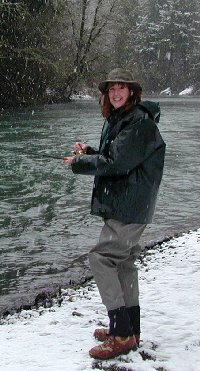 I stood at the edge of the water with rod in hand the day that I fished the river so hard. I stood at the edge of the water, 20 feet above maple tree hole. Visibility was a proximately four feet or so. Low and clear. The water from the riffles above me, slapped at my boots. The river dropped in front of me, fast. Perhaps eight feet out, the water went from my boots, to six feet in depth. It got deep fast, with sand and boulders like stair steps from my toes. At that six foot depth, I stared and I was getting a bit dizzy from the waters action. Just as I threw out my jig, I returned my gaze to that depth and a late December silvery bright chinook came into sight! Was I dreaming? Was I just dizzy-delirious? No! I saw it! It came into view, did this fantastical turn and was gone! I saw it! I saw that! Surprises like that in nature are rare, but that's what continues to call me! The gift of visions of salmon, dancing in my head! I thought to myself, that I'd rather see something like that, than catch a steelhead! You know, it flashed and matched my fingernails, too! It was awesome, in the true sense of the word! Happy New Year to all of you, and may your year be full of visions of sugar plums dancing in your head! er... I mean... salmon!